Record of a varied career at sea over several decades - from Merchant Navy cadet to tanker captain. A boyhood visit to the battleship HMS Nelson left the author with the ambition to be a midshipman in the Royal Navy and to be in charge of a steam picket-boat with a brass funnel. The author relates how he sent to sea, some of his adventures and experiences ashore and afloat during his 35 years service under the White Ensign and the Red Ensign. Starting as a Merchant Navy cadet in the British India Steam Navigation Company at the start of World War II, he subsequently joined the Royal Navy and progressed from midshipman to lieutenant during ten years of service in eight different classes of warship. Leaving the Royal Navy after the war, he spent several years in various shoreside occupations before returning to seafaring in the Merchant Navy. He joined the fleet of a major oil company as a junior officer and quickly progressed through the ranks until he reached the rank of master, spending many years in command of large crude oil tankers. 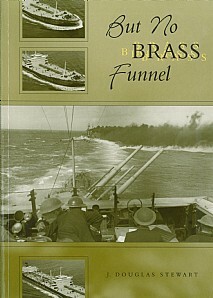 Although Captain Stewart served in eight classes of warship and many more types of tanker, he never did command a picket boat with a brass funnel. This book will be of immense interest to those who enjoy maritime and modern history, ship enthusiasts or anyone simply looking for a good read.